WASHINGTON, March 30, 2010 — With 2010 sui­cide num­bers slight­ly above last year’s and com­ing off the worst Jan­u­ary on record, the Army Nation­al Guard is empha­siz­ing resilience, tran­si­tion pro­grams and the impor­tance of ask­ing for help. 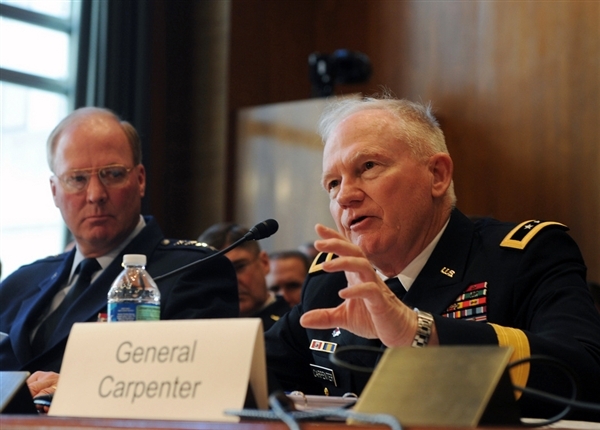 Air Force Gen. Craig R. McKin­ley, left, chief of the Nation­al Guard Bureau, lis­tens as Army Maj. Gen. Ray­mond W. Car­pen­ter, act­ing direc­tor of the Army Nation­al Guard, tes­ti­fies before a March 24, 2010, hear­ing of the Sen­ate Appro­pri­a­tions Committee’s sub­com­mit­tee on defense in Wash­ing­ton, D.C.
“We are alarmed by the sui­cide rates we’re see­ing inside the Army Nation­al Guard,” Army Maj. Gen. Ray­mond W. Car­pen­ter, the component’s act­ing direc­tor, told the Sen­ate Appro­pri­a­tions Committee’s sub­com­mit­tee on defense in March 24 tes­ti­mo­ny. Sui­cide con­founds easy expla­na­tion, and deploy­ment might not be the whole answer. Sen­a­tors and Nation­al Guard lead­ers dis­cussed unem­ploy­ment, finan­cial dis­tress, a chal­leng­ing econ­o­my and reluc­tance to ask for help as con­tribut­ing fac­tors. Army Nation­al Guard sui­cides increased 75 per­cent in 2009, accord­ing to Sen. Daniel Inouye, the com­mit­tee chair. Car­pen­ter said 24 sui­cides are cur­rent­ly being inves­ti­gat­ed for 2010, a slight increase over the 22 who had tak­en their own lives dur­ing the same peri­od in 2009. The Air Nation­al Guard lever­ages Army Nation­al Guard pro­grams and adds its own ini­tia­tives, Air Force Lt. Gen. Har­ry M. Wyatt III, the direc­tor of the Air Nation­al Guard, said. Those include exist­ing wing fam­i­ly sup­port coor­di­na­tors and new behav­ioral health pro­fes­sion­als. “These indi­vid­u­als will be pro­vid­ed to the adju­tants gen­er­al to be placed with­in their states at his or her direc­tion,” Wyatt explained. The Air Guard also is work­ing to assure pro­grams at active duty bases and posts are avail­able to reservists. “Some of the return­ing Nation­al Guard mem­bers are not hon­est on their post-deploy­ment health assess­ments, sim­ply because they don’t want to be delayed going home,” Sen. Pat­ty Mur­ray not­ed. Car­pen­ter said the Army is reeval­u­at­ing those assess­ments – the first time a study has been done on the Guard and Reserve process in almost three decades. “The ini­tia­tive that’s being con­sid­ered at this point is for the sol­dier to be hon­est with what­ev­er emo­tion­al or phys­i­cal prob­lems they might have, be allowed to go home and be with their fam­i­lies, and then allow them to return to get the nec­es­sary treat­ment,” Car­pen­ter said. Army Nation­al Guard pieces of the solu­tion include the active duty Army’s Sol­dier Fit­ness Pro­gram and a part­ner­ship with the Army Reserve in the Hel­mets to Hard­hats pro­gram. Indi­vid­ual states also have pio­neered pro­grams designed to reduce sol­dier and air­man sui­cides, such as the Kansas Nation­al Guard’s Flash For­ward and the Michi­gan Nation­al Guard’s Bud­dy to Bud­dy pro­gram.